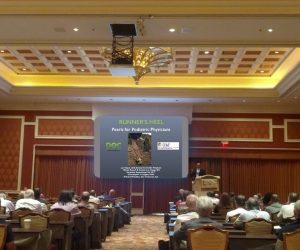 Dr. Christopher Segler was invited to get several lectures at the International Foot and Ankle Foundation 23rd Annual Las Vegas Seminar. The task was to help other podiatrists, foot and ankle surgeons and sports medicine specialist understand the keys to helping injured runners continue running. His talks were entitled When Do Runner’s REALLY Have to Stop Running?, Runner’s Heel: Pearls for Pediatric Physicians, and Minimalist vs. Maximalist Running: Current Trends & Related Injuries.